I’m sitting here sipping Dollar Store wine (another story for another time) and listening to The Cowboy Junkies’ Trinity Sessions. This is one of the great albums of all time. I never get tired of it. 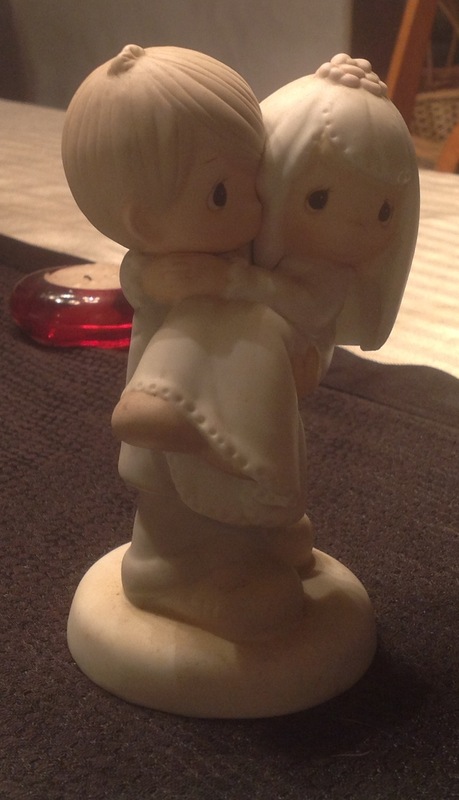 Earlier I was playing on Facebook and sorting out the china cabinet when I was provoked to post a picture of my handiwork and, later, a promise/threat to blog about the china my daddy gave me. I don’t make idle promises or threats. When I was 12, I was a hormonal mess and my father got posted to Iwakuni, Japan. We found out later that he was really slipping in and out of Vietnam in the waning days of that gawdawful war. Like I said, I was a hormonal mess and my father’s leaving, though by no means the first, hit me hard. This was his fourth tour to ‘Nam and I was old enough to understand. Just before my 13th birthday, I got a priceless letter from him in response to my birthday list he’d asked for. I can’t find that letter and it’s driving me crazy. It’s a gem and highlights all the fine points of my daddy, particularly his sense of humor. 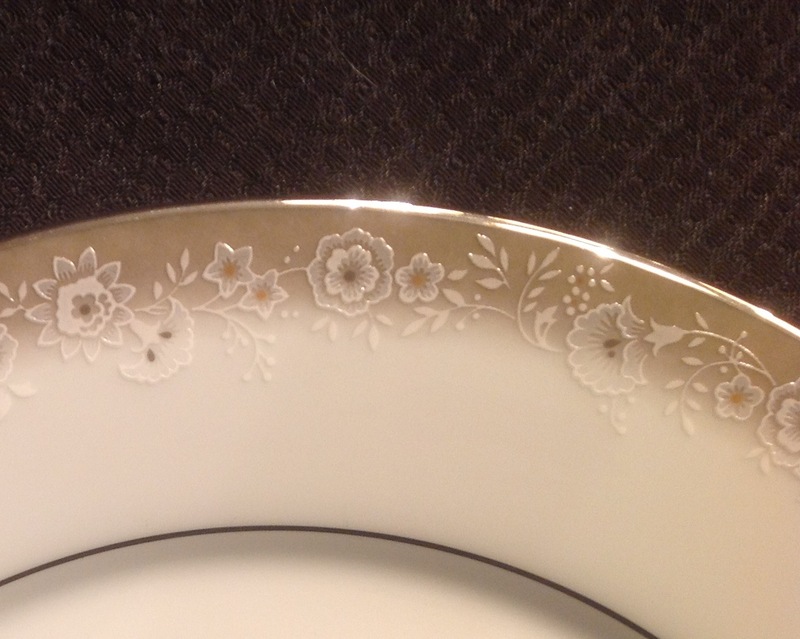 I n any event, I got a catalogue of Noritake china and Sanyo stemware and was told to pick out patterns. As he was in Japan, not really, I was getting china for my birthday. I’ve been odd since birth. I was ecstatic! I like shiny, bright things and I like food and I love my daddy. I picked out a pattern with the coordinating stemware that would have been at home in an Andy Warhol painting. It was the 70s. I don’t know if he lied or not, but Daddy said that the pattern was discontinued so he winged it. I received a disappointing and understated set of china for 12 with coordinating stemware. Disappointing in its elegance, it was from my dad and I loved it nonetheless. I carried that china from one posting to another and from one apartment and house to another, finally unpacking it and using it for the first time roughly 30 years after I opened it. In the intervening years my tastes changed and the beauty of it just takes my breath. It’s basic white china with a smoked rim. 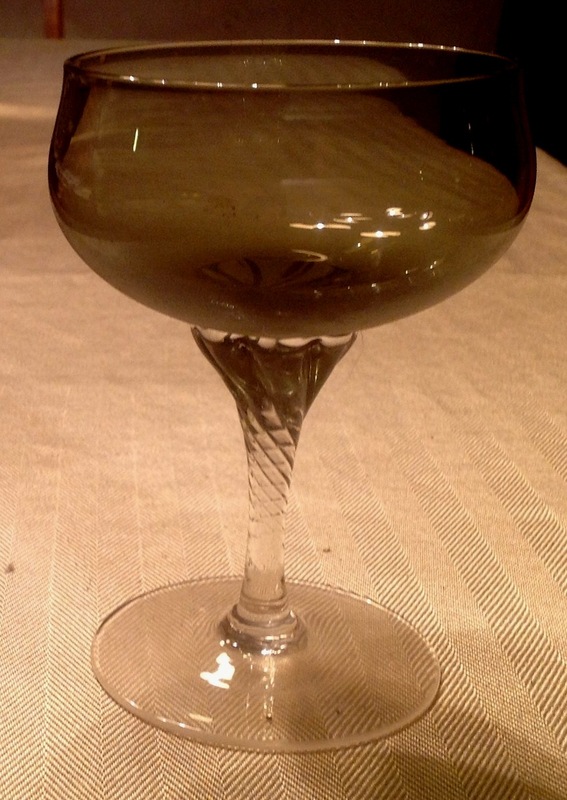 The glassware is a smoky black. The serendipity of it all is that without my thinking about it, I decorated this room in a black, brown, white, beige scheme when The Ex and I finally caved and hired a professional to finish the barn. I had to whine and carry on, beg and plead, but I convinced The Ex that after 30 years, I needed and deserved a china cabinet to put the china in. As we were so far over budget by that time, he just threw up his and hands and nodded yes. 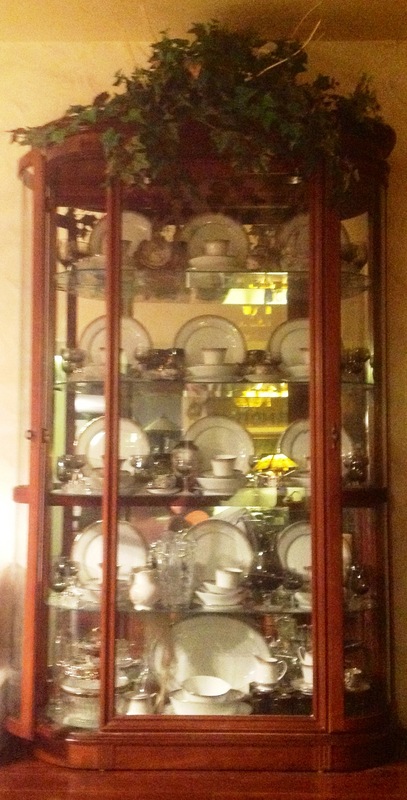 The china cabinet and china slid into this room like it should have always been here. It takes my breath, it does, it does. Also in the cabinet are some pieces that mean something to me for other reasons. Chief are some moriage dragonware that just make me swoon. DragonMan and I discovered the pattern in an antique store outside of Boston one summer. I’ve decided I need snack plates to prop in front of the dinner plates. 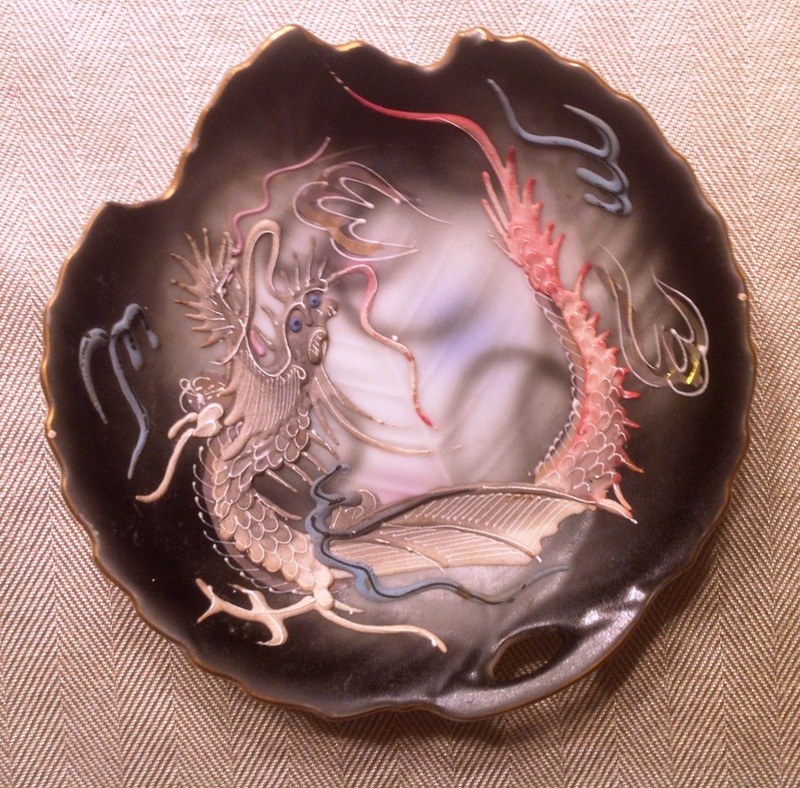 I have my daddy’s china, Doug’s dragonware, and the wedding mementoes from The EX – all three good men and the love of my life at one time or another. Love is a funny thing. I still love all three of them. Vietnam changed Daddy, change took The Ex and death Doug. But all three of them glitter and glow in a china cabinet from the J. C. Penney. Good men abound and I’ve been blessed more than my share. The picture doesn’t even begin to do it justice. I can’t figure out why, but it’s really difficult to photograph.